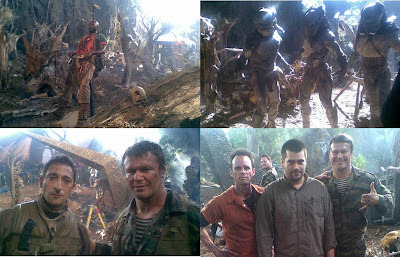 Last month 20th Century Fox debuted the First Full Trailer for Nimrod Antal's Predators!. I found it appropriate to follow that up with a cool inside look/featureatte. The video comes from Germany (via YouTube) but isn't dubbed, so it's watchable and in high def, too. It mainly contains some interview segments with Rodriguez and Antal as well as some cool new footage, including dialogue from Danny Trejo. I've said it before and I'll say it again, I loved the original and I'm hoping this reboot will be equal to that. I doubt it will, but it can't hurt to hope, right? Either way I'm looking forward to seeing this movie come summer time. Predators is being directed by Nimród Antal, of Kontroll, Vacancy, and Armored previously. The screenplay was co-written by newcomers Michael Finch and Alex Litvak and is based on early draft written years ago by producer Robert Rodriguez, who also worked with them on the script. This is a reboot of the Predator series created by Jim & John Thomas and directed by John McTiernan in 1987. We're not sure what the actual plot is, but all we need to know is that it's about a bunch of badass elite warriors who fight a bunch of predators out in the jungle. 20th Century Fox is bringing Predators to theaters worldwide on July 7th. I think it's funny that they named their son, Nimrod.